Today's online design plan is for the brand new home located in rugged Texas hill country north of Austin, where the Property Brothers have filmed many of their shows. (No pressure right? Other homes in the area were designed by Jonathan and Drew!). Right now, the home is used as a vacation getaway. They entertain family and friends on weekends, but eventually this will be their full time retirement home. Our goal in this design project was to give them a fresh, contemporary design with rustic, character rich pieces for a fun, comfortable space the whole family will enjoy. 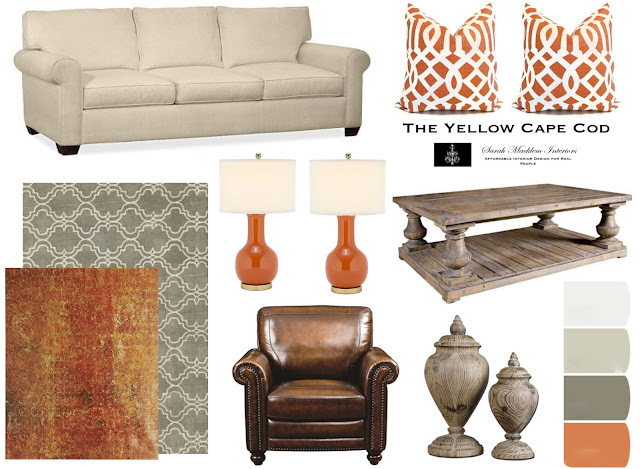 The furniture arrangements we suggested allow their AMAZING stone fireplace to be the main focal point of the space. The clients neutral sofa's and rich leather club chairs were the basis of the new design. 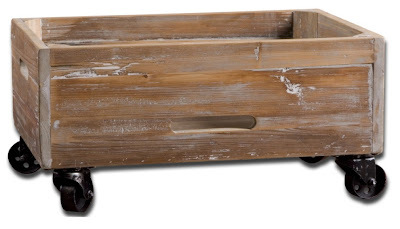 This fabulous rolling storage box is the perfect companion to the occasional tables we suggested. This box is perfect for the client to stash her grandsons legos, books, puzzles, games etc. 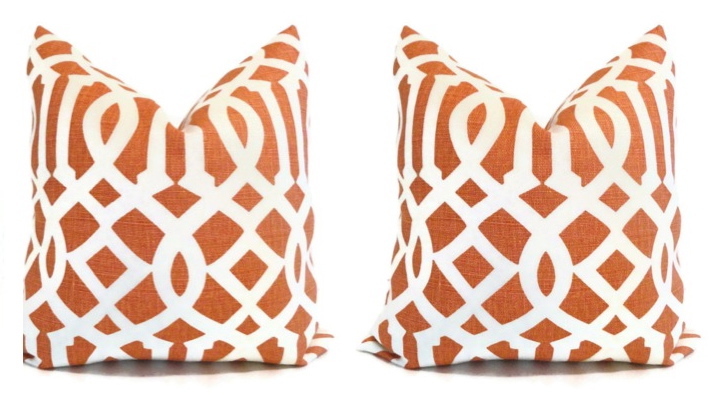 These jaw dropping pillows from Etsy will steal the show against neutral sofa's and rich leather club chairs. 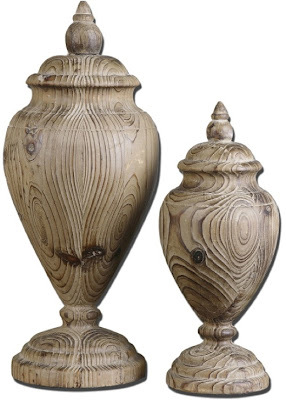 We added fun lamps and unique accessories like these amazing oversized wood finials, now available in my shop, please click here. Not only are the rug and art we selected gorgeous, but they are very large in scale. To anchor this large, open room we recommended a 9' x 12' area rug. The large stone fireplace required a large piece of art to be placed over mantle and this captivating orange and gray print measured in at 40" x 50". 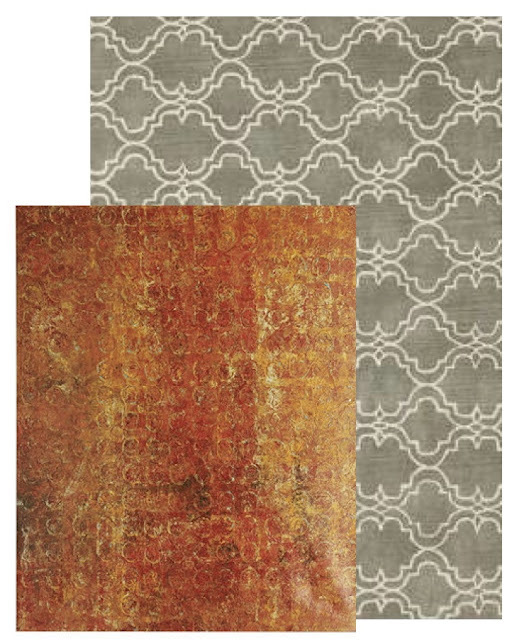 While scale, color and pattern were really important in this design, so were the small details. This round accent table has a big personality. 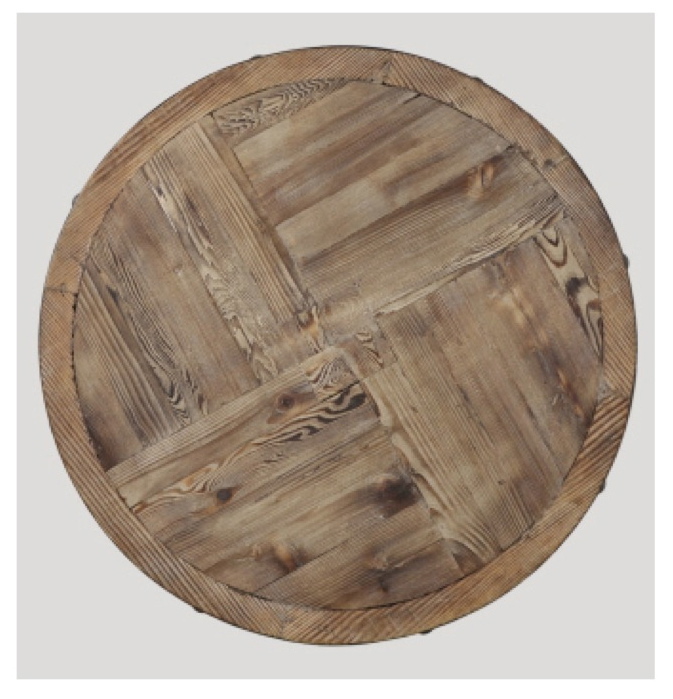 Metal banding and an amazing weathered wood finish give this piece tons of character. Our client loves to go "antiquing". While this room is fresh and now, it still embraces her vintage and antique collectables. If you are considering a room re-design, now is the time to make your online design reservation. This time of year fills up fast. There are currently a few spots available. 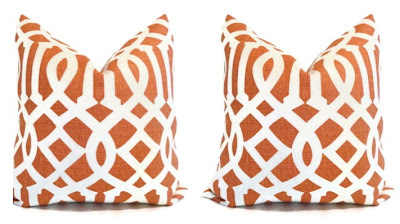 Love gray and orange combo and that couch is awesome! Love this color scheme! Very fresh and comfortable. The touch of leather in the chair is fantastic. 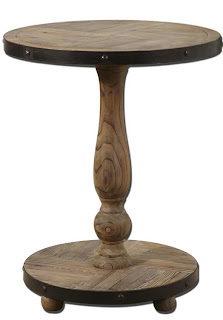 I'm having trouble finding the round wood accent table in your shop. Any suggestions? Thanks! Love the colors you picked out for this room. I have chosen the same colors for our living, the neutral chairs makes it easier for me to change the accessories when the season changes.